This past year seems have to be great for touch screen mobile phones. 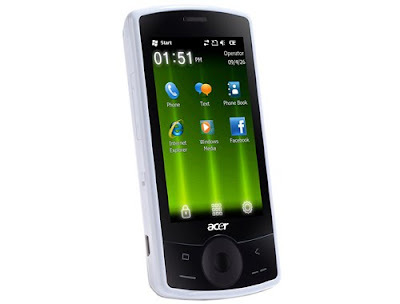 Acer has released its three new mobile phone with its latest technology. It has series of Touch screen which will handle easily from the users. These touch series are coming in two colors with beautifully designed.These mobiles are mainly aimed at the economical and trendy , specially attraction for youth. Out in the market just a week Acer touch series offers the most recent trends in the mobile technology that suits every kind of mobile user. Acer NeotouchS200, Acer betouch E100 and Acer E200 betouch, Acer E100 betouch, Acer neotouch S200. Acer E200betouch is designed to slide in somewhere towards the budge tend of the smart phone market. It measures 110*53.5*15.4mm and it is available in black and white color with attractive silver color band at the edge of the phone. It has 3.2 inch touch screen , GPRS, HSDPA,Assisted-GPRS, Mobile Internet fun, easy and perfect to use. The Acer E100betouch has a slim design being just over 12mm thick and support,Windows Mobile 6.5 and is powered by 528 M Hz CPU. Its features are 3.2 inch WQVGA touch display, GPRS, 2 megapixel camera and HSDPA network. It has 3.2 inch touchscreen feature with 240*400px resolution with 65Kcolor, 2megapixel camera with digital zoom, internal memory of 512MB and expand via SD card slot. Acer has launched its new NeoTouch S200 is finally in the market. It gives bright and crisps images but you need to hold in the sunlight. Main features of Acer Neo Touch S200 are 2G-GSM 850/900/1800/1900, 3G- HSDPA/850/1900/2100, micro SD card up 32GB. Primary features are 5MP, 2560*1920px, Auto focus, LED flash.Oval size touchscreen display that measures 3.8 inch's, coming along with native resolution of 480*480px and 65K color. The Acer neo touch S200 (known as the new Touch S200 in France and US) . Codenamed F1 when initially announced at Mc2009, this is the second WM smartphone on the market that feature 1GHz Qualcomm Snapdragon processor. Really excellent news, and of course nice image too. Thanks.